On the 8th of June 1956, Cubist artist Marie Laurencin died in Paris at the age of 72. During her lifetime, Laurencin achieved a successful international reputation, especially in the 1920s and 1930s. Even earlier though at the Salon des Indépendants (1910-1911) and the Salon d’Automne (1911-1912) she exhibited alongside Pablo Picasso, and Cubists associated with the Section d’Or, such as Jean Metzinger, Albert Gleizes, Robert Delaunay, Henri le Fauconnier and Francis Picabia. She famously had a relationship with the poet Guillaume Apollinaire and is often referred to as his muse. Allegedly, Laurencin had both heterosexual and lesbian affairs, some of her significant connections including people such as the American expatriate and renowned lesbian writer Natalie Clifford Barney. Laurencin’s works were exhibited widely and purchased by astute modern collectors, such as Gertrude Stein, John Quinn, Claribel and Etta Cone, and Chester Dale. It seems that posthumously Laurencin and the reputation she carved out during her lifetime were largely forgotten. 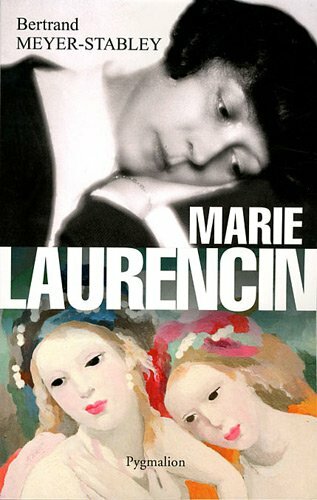 Perhaps the most recent detailed analysis of her work, but mainly lifestyle was undertaken by Elizabeth Louise Kahn in her book Marie Laurencin: Une Femme Inadaptee in Feminist Histories of Art (2003), in which the author scrutinizes Laurencin’s art and writings, focusing often in a forced fashion on her alleged lesbian identity. Kahn’s efforts should be lauded, though, in trying to bring new focus on the artist and re-establishing her position in the Parisian artistic avant-garde. Generalised critiques placed Laurencin alongside female Cubists, such as Sonia Delaunay, Marie Vorobieff, and Franciska Clausen, but Laurencin’s art showed an unprecedented approach to abstraction which was lyrical and often focused on figure compositions of women and fe male portraits as well as self-portraits. Whilst Cubism in general is perceived as a masculine trend, not only due to the predominant male gender of its lead names, but also due to the structured style in Cubist works, the geometry of construction, the dissection of spacial planes, which imply a certain rationalised approach. Laurencin’s work can be found on the periphery of Cubist norms: the artist seems to have followed a specific feminine aesthetic by her use of soft pastels, rounded forms and flowing lines. “Laurencin’s insistence on the creation of a visual vocabulary of femininity, which characterized her art until the end of her life, can be seen as a response to what some consider to be the arrogant masculinity of Cubism. Apollinaire’s extravagant praise and characterization of Laurencin’s art as elegant and quintessentially feminine, coupled with her soft, decorative style and pastel palette, continue to disconcert and exasperate feminist historians, many of whom have underestimated her or dismissed her for selling out to the male establishment. Her narcissistic and sexually ambiguous art likewise argues for a more nuanced, open-ended interpretation of her sexual identity. Laurencin retained her interest in interrogating her own features and continually projected her image, even in her depictions of other women.” (Heather McPherson, review of Marie Laurencin: Une Femme Inadaptée in Feminist Histories of Art by Elizabeth Louise Kahn, in Woman’s Art Journal, Vol. 26, No. , Spring – Summer, 2005). One thing is certain: this is an artist whose work is extremely hard to read from an ideological point of view, particularly as far as gender politics is concerned. Very rarely, Laurencin does depict women in intimate situations, but the vast majority of her works feature an idealised world, a vague feminized universe which is hard to interpret. However, self-assertive tendencies do surface throughout her career. “The portraits and group portraits Laurencin painted of Picasso, Apollinaire, and Salmon provide a complex narrative that reflects her jockeying for position in the Paris art world and her growing artistic independence. More than anything else, Apollinaire’s enthusiastic promotion of Laurencin’s quintessentially feminine art has served to disenfranchise her. Apollinaire also presciently noted that her feminine portraits depicted a distinctive modern type-the “Marie Laurencin woman.” In 1913 Salmon came to Laurencin’s defense, championing her unconventional art and its feminine focus, which he recognized as strange and voluptuous.” (Heather McPherson ). So, although on the surface (and in her journal notes Le Carnet des Nuits), she seems to show an attitude which is largely submissive towards the superiority of male talent, could Laurencin, through her art, have been quietly campaigning for a recognition of the work of female artists? Reblogged this on · BulletSnake ·. Thanks for this – I’m always in awe of the wonderful information you provide, so enlightening.